A swamp-shack hillbilly album that captures this bands singular sound, dubbed "Junkerdash"; the album was recorded live around one microphone straight to a Nagra tape machine , "session style," at the Gage Street Market in Boise, Idaho. Filtered through a half-century of folk, country and rock ‘n’ roll, and fed by family history and an affinity for acoustic mountain music, medicine show culture and Depression-era string-band blues, Hillfolk Noir’s peculiar roots gumbo is, like the carnival midway, at once inviting and foreboding. Look no further than 2008’s "Diggin’ Songs" — a concept album of toe-tapping songs about grave matters — for proof. Before Hillfolk Noir, Travis played in a variety of bands reflecting his eclectic tastes — indie rock, roots rock, old-fashioned folk, country blues, old-time, singer-songwriter — and as he moved forward with his own music, he looked further and further into the past. “I was around music a lot when I was young,” he says. “My grandpa was a multi-instrumentalist, so I often heard him playing polkas on the accordion or singing ballads and playing harmonica. My mom played the drums in rock ‘n’ roll bands and toted me along to gigs and rehearsals. Hillfolk Noir’s contribution to this century-old language has been described as a dark, country-tinged, swampy-swingin’, hillbilly-delta-blues-ragtime word machine. Acoustic death-folk works, too. Or Junkerdash, the band’s invented name for its singular sound. 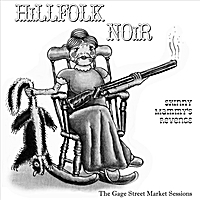 Hillfolk Noir has recently (Dec, 2010) released two new records — both on-location field recordings "Live at the Old Idaho Penitentiary" is a multi-track recording of an eight-piece band performing live in an old prison block at the historical Old Idaho Penitentiary. "Skinny Mammy’s Revenge" is a series of recordings made in living rooms and cabins. All of the songs were recorded around a single microphone to analog tape. Other notable projects include the aforementioned "Diggin’ Songs," the score to a film ("Ibid") by Frozen River director/Oscar nominee Heather Rae and Russell Friedenberg, and a monthly DVD video subscription project with the Trey McIntyre Project contemporary dance troupe (http://www.treymcintyre.com/9+1/Pages/9+1_HillfolkNoir.html).